Education has become one of our major concerns, at the heart of any strategy for prosperity and social cohesion. But young people are having more difficulty than ever before in adapting to the world they will enter as adults. 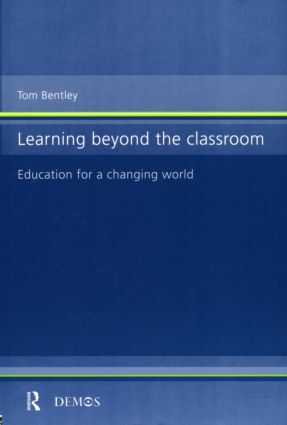 Tom Bentley argues that if education is to meet the emerging challenges of the twenty-first century, we must recognise that learning takes place far beyond the formal education sector. We cannot rely solely on dedicated teachers to deliver the understanding and personal qualities young people will need. Instead we must connect what happens in schools to wider opportunities for learning. Drawing on a wide-ranging review of educational innovation and on contemporary analysis of economic, social and technological change, this book shows that creating an education revolution requires us to think far more radically about young people and the options for reform, and outlines a vision of education fit for the twenty-first century. Tom Bentley is a senior researcher at Demos, the independent think-tank. He was born and educated in East London and at Oxford University. His research areas include: young people, education, the future of work and combating of social exclusion.